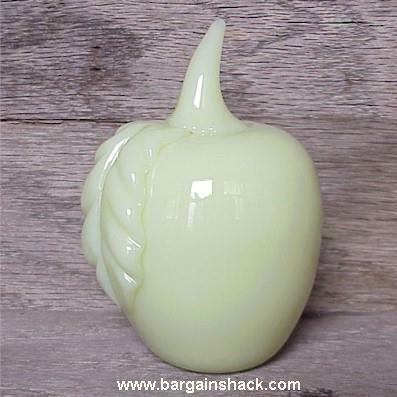 Apple Paperweight in Custard, Bargain Shack offers Boyd Glass, Mosser Glass, L.G. Wright, and Contemporary Collectible Glass including Vaseline Glass - J.B. Scottie Dogs, Pooche, Animal Covered Nests, Toothpick Holders, Salts, Glass Animal Figurines, Clowns, Dolls, Slippers, Vehicles, and More! Now you too can go to the head of the class with this beautiful Apple Paperweight in custard! Custard glass is really neat! It has a warm glow under a blacklight similar to vaseline glass! Standing 3-1/2" tall this apple weighs almost 1-1/2 pounds! That is some heavy fruit! The bottom of the apple is marked Gibson 2000. The factory closed several years ago and I only have one custard glass apple left in stock.